To get that stubborn makeup off, try using a little bit of bar soap.Lather the bar soap in your hands and rub it over your face and eyes. I have found that this completely removes all my eye makeup and I don't get out of the shower looking like a raccoon! 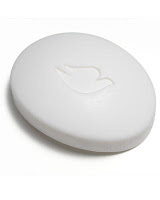 A gentle, moisturizing soap like Dove would probably be best- but I just use whatever we have!